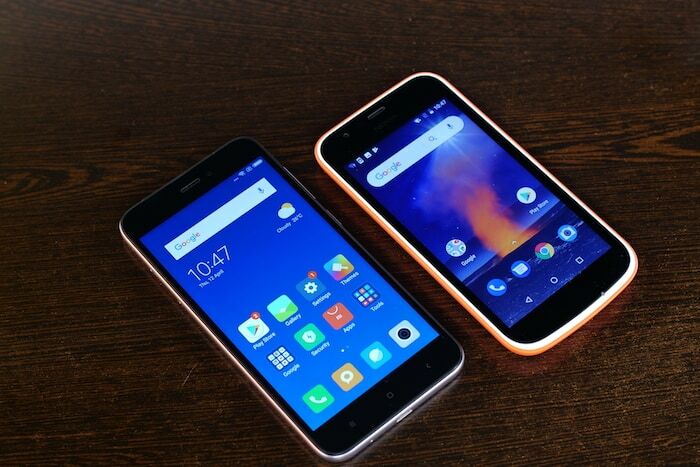 Home Mobile Nokia 1 vs Redmi 5A: Is Android Go Worth It? 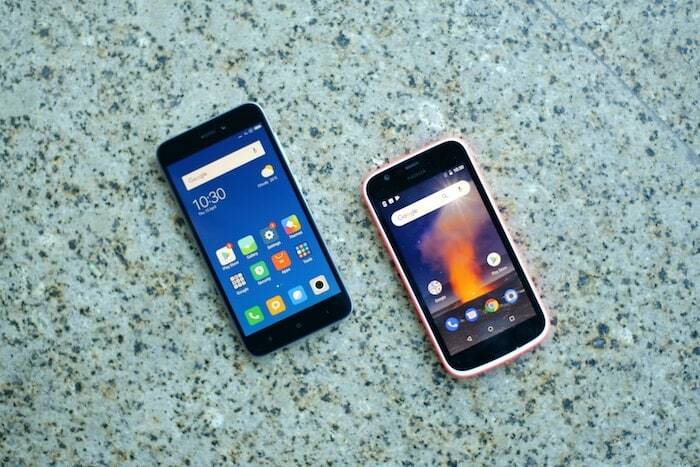 Nokia 1 vs Redmi 5A: Is Android Go Worth It? When it comes to design and build quality, Xiaomi has always delivered even when it comes to their cheapest devices, and Redmi 5A is no exception. Although the smartphone is made from plastic, it feels really nice in hand. 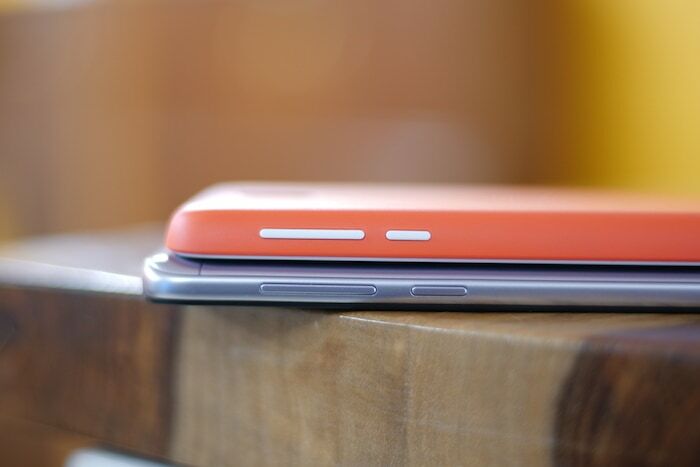 The metallic color finish of the smartphone will also easily fool anyone unless they touch the device themselves. The smartphone sports a 5-inch display at the front, charging port on the bottom, and a headphone hack at the top. Redmi 5A packs a dense build and feels really sturdy. Nokia 1 was has taken just the opposite route of Redmi 5A when it comes to using plastic in its design. While Redmi 5A will rather have you think that it’s built from metal, Nokia 1 flaunts its plastic design. Its colorful back with layered construction at the front will never get confused for a meta build. To be honest, I like Nokia 1’s approach here more than the Redmi 5A’s. I mean, if you have to use plastic, better make sure that you are taking advantages of that material and not try to hide it. To me, Nokia 1 also feels better in hand with its polycarbonate back giving a better feel than the one of Redmi 5A. Nokia 1 also feels perfectly weighted something which cannot be said about Redmi 5A. Rest of the construction is pretty similar, with the display at the front, charging port at the bottom, and headphone jack at the top. To conclude this section, while some might disagree with me here, I prefer Nokia 1 to Redmi 5A when it comes to design and build quality. While Nokia 1 wins the first category, it looses horrendously when it comes to display. Not only the Nokia 1 packs a smaller display, it’s also of very low quality. The display sports a resolution of 480 x 854 (480p) which comes to just ~218 PPI. In comparison, the Redmi 5A sports a 5-inch display with a resolution of 720 x 1280 (720p) which equates to 296 PPI density. Not only the Redmi 5A’s display looks good owing to the higher resolution, somehow it also feels more fluid and responsive when I was interacting with it. I also hate the fact that despite having a big old chin, Nokia 1 doesn’t offer any physical or capacitative buttons and utilizes the on-screen button which further eats away on that precious screen real estate. The bottom line is that the Redmi 5A’s screen is far better than Nokia 1’s and hence it wins this round. Just like I don’t usually value paper specs, I don’t value benchmarks. However, as I said when it comes to ultra-budget devices, every bit of juice matters. 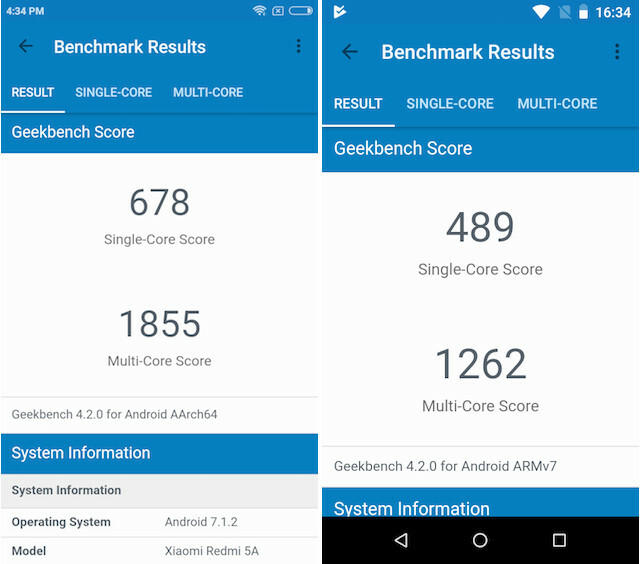 On Geekbench 4, Nokia 1 scored an abysmal 489 and 1262 for single and multi-core respectively. In comparison, the Redmi 5A delivered a single-core score of 678 and a multi-core score of 1855. And the difference in scores is heavily reflected in both the device’s performance. With apps downloading in the background, Nokia 1 stuttered heavily when I was trying to browse the web. Web page scrolling was bad to say the least, and overall the phone just could not handle multiple apps. While Redmi 5A will not set any performance records, it constantly outperformed Nokia 1, whether when browsing articles on the web, keeping multiple apps open in the background, or anything else. It’s mainly due to the fact that Redmi 5A uses a Snapdragon 425 processor and an Adreno 308 GPU while the Nokia 1 compromises with the Mediatek MT6737M processor and the Mali-T720 GPU. Redmi 5A wins this round too. 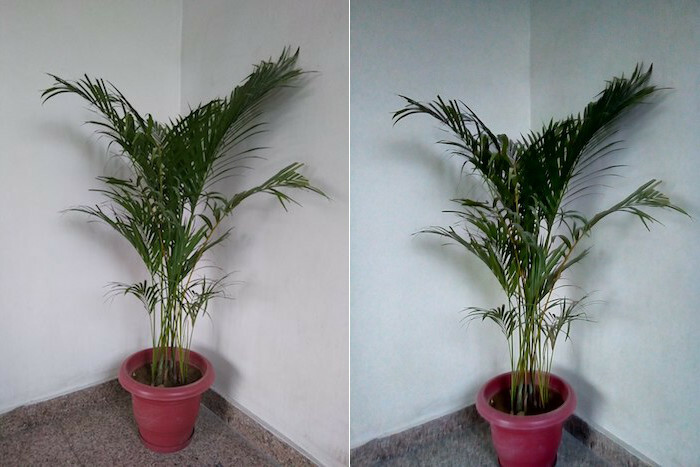 While you should not be expecting good picture quality from smartphone cameras with this price point, I was surprised to see how Redmi 5A performed. 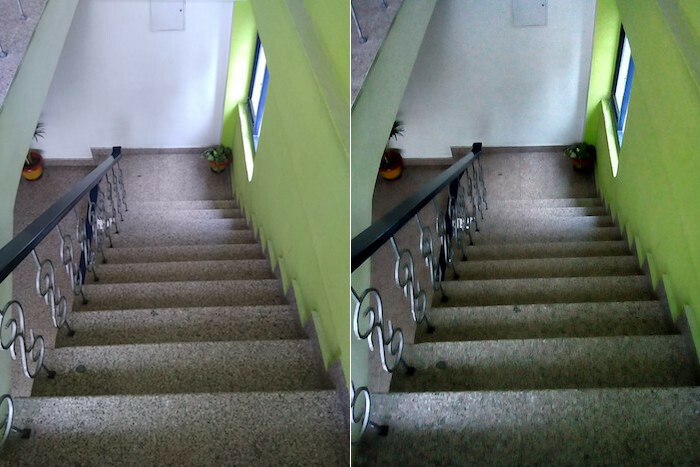 The smartphone was able to take good pictures in bright light conditions. There was no noise and overall the picture quality is better than what you would expect from a device of this price range. As far as Nokia 1 is concerned, it seems like that it is made for curing smartphone camera addiction. The phone takes such bad pictures that my original 3310 would have taken better pictures with it. I am saying this while knowing quite well that the original 3310 didn’t had a camera. 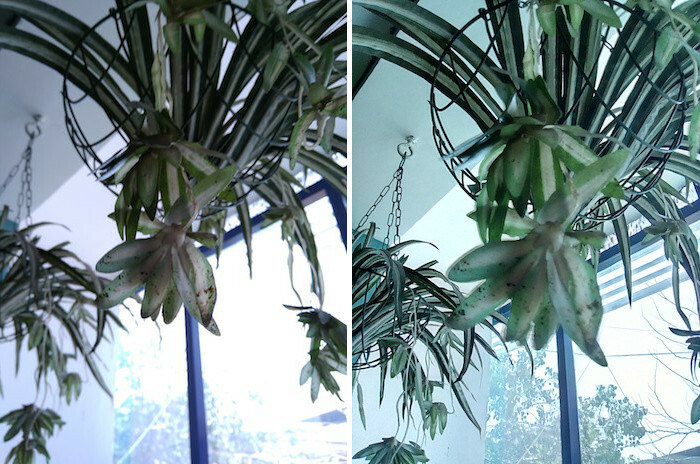 If you love clicking photos, this is not the phone for you. But, don’t take my word for it and watch the images to see for yourself. As we all know, Redmi phones run on Xiaomi’s official ROM MIUI 9 which in the case of 5A is built on top of Android 7.1.2, Nougat. On the other hand, the Nokia 1 is running Android Go Oreo. 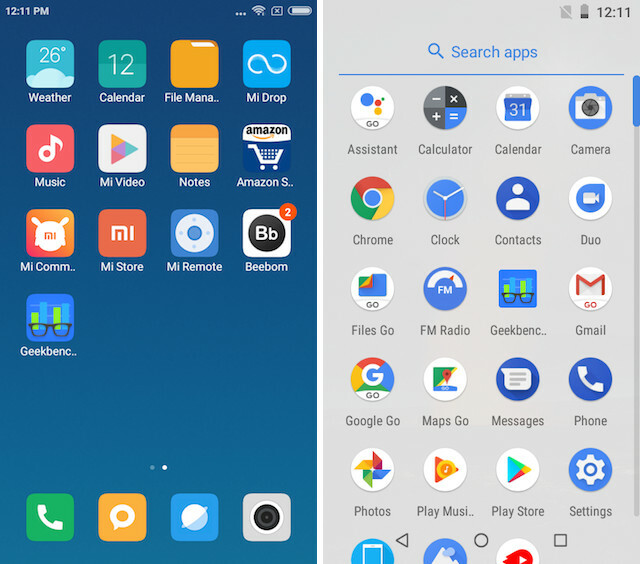 Since, everybody knows what they can expect from MIUI9, let us see what Android Go brings to the table. When it comes to looks, Android Go Oreo looks exactly like Android Oreo with a vanilla Android look and no bloatware. That means that all you are getting is Google’s official apps and nothing else. That said, the Android Go version of apps are a bit different from the normal Android apps. If you want to see a full comparison between both kind of apps, you can read our previous article which goes in-depth on this matter. Right now, the only thing that you need to know is that Android Go apps are light, do not take much space on your phone, and are built in a way that they save mobile data. I love Android Go apps with the exception of Maps Go, as it doesn’t support turn by turn navigation. In any case, if you are not happy with the Go version of the app, you can always download the regular version from the Play Store. Comparing it with the MIUI 9 on Redmi 5A, the first big advantage is that with Nokia 1 you are getting Android Oreo against Android Nougat. We also know that Xiaomi is notorious for pushing software updates at a snail’s pace, so your chances of getting Android security updates and normal software updates are way better with Nokia 1 than Redmi 5A. So yes, there are a lot of positives Android Go brings to the Nokia 1 but even with all the positives, I would prefer Redmi 5A’s MIUI here because of the full Android experience it brings. I mean, Android Go apps are great but why will I prefer them if I can get the full fledged Android apps at the same price. While Redmi 5A sports a bigger 3000 mAh battery against the 2150 mAh battery on Nokia 1, I got almost similar battery life on both of them. 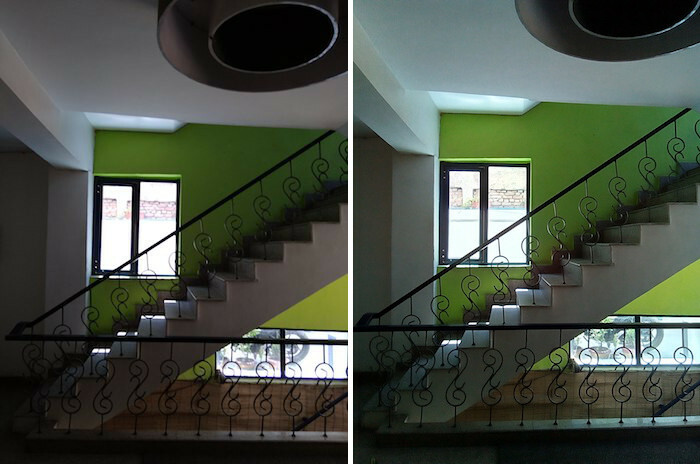 This is owing to the display on Nokia 1 which is not only smaller but also has a far lower resolution. 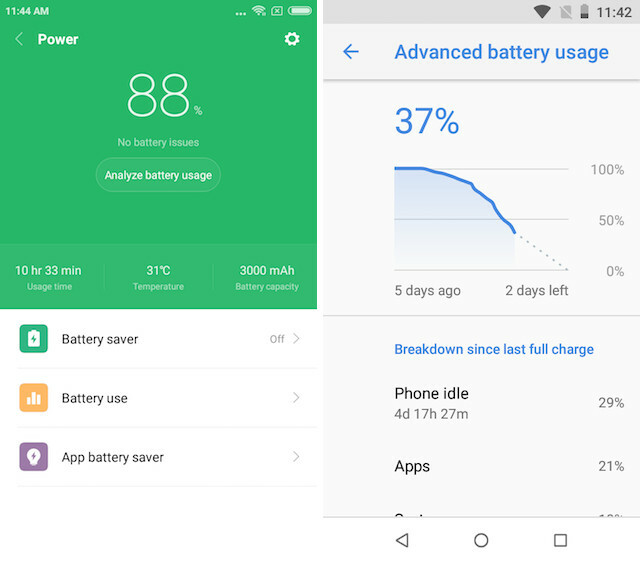 Also, the Android Go operating system with the Android Go apps are highly optimized which also results in better battery life. This one is a tie. When it comes to pricing, Nokia 1 is available for Rs. 5,434 while the Redmi 5A (2GB/16GB), is available for Rs. 5,999. That said, Xiaomi is selling Redmi 5A under its flash sale strategy which will make it very hard for you to buy this phone while you can buy the Nokia 1 whenever you want. SEE ALSO: Redmi Note 5 Pro vs Mi A1: Best Budget Smartphone? 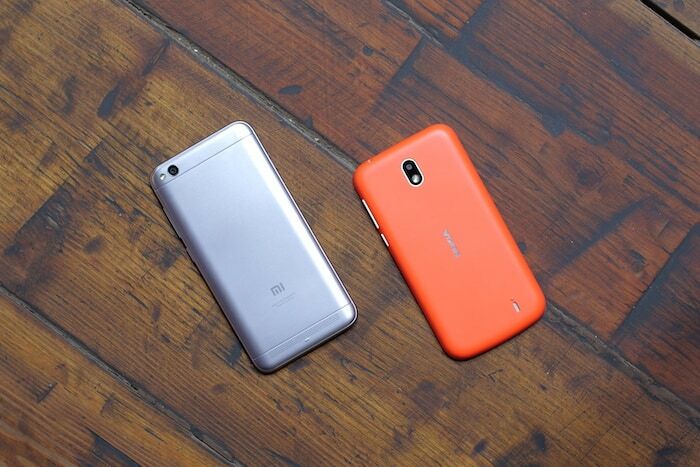 Redmi 5A vs Nokia 1: Which One You Should Buy? Well, as it must be clear by now, Redmi 5A is the clear winner of the two. That being said, Nokia 1 is not bad by any standards. In fact, when it comes to build quality, I prefer it over the Redmi 5A and even though I would prefer the full Android experience, Android Go is a great platform with some decent apps and no bloatware at all. The problem that Nokia 1 is actually facing here is its pricing. Redmi 5A offers way more than Nokia 1 when it comes to raw specs at just 1000 rupees more. If HMD Global priced Nokia 1 at Rs. 2,999 or even Rs. 3,499, I would have no qualms in recommending it. However, at Rs. 5,434, it will be a hard sell for Nokia.